The fossil trackway covers a fallen boulder that now rests along the Bright Angel Trail in the national park. Rowland presented his findings at the recent annual meeting of the Society of Vertebrate Paleontology. 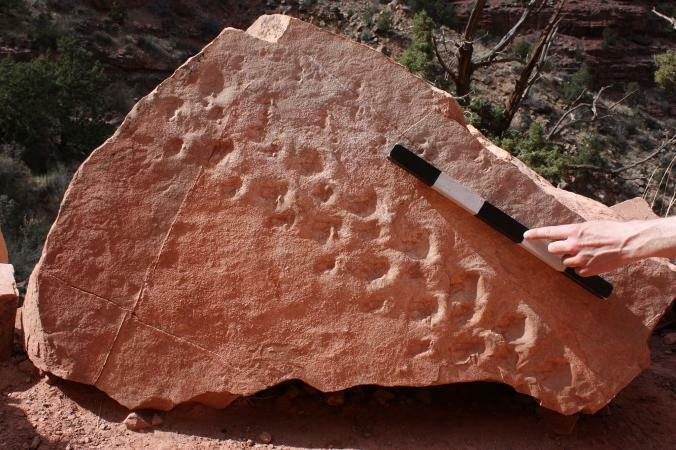 "It's the oldest trackway ever discovered in the Grand Canyon in an interval of rocks that nobody thought would have trackways in it, and they're among the earliest reptile tracks on earth," said Rowland. Rowland said he's not prepared to say that they're the oldest tracks of their kind ever discovered, but it's a possibility, as he's still researching the discovery. "In terms of reptile tracks, this is really old," he said, adding that the tracks were created as the supercontinent Pangaea was beginning to form. "My first impression was that it looked very bizarre because of the sideways motion," Rowland said. "It appeared that two animals were walking side-by-side. But you wouldn't expect two lizard-like animals to be walking side-by-side. It didn't make any sense." When he arrived home, he made detailed drawings, and began hypothesizing about the "peculiar, line-dancing gait" left behind by the creature. "One reason I've proposed is that the animal was walking in a very strong wind, and the wind was blowing it sideways," he said. "I don't know if we'll be able to rigorously choose between those possibilities," he said. "It absolutely could be that whoever was the trackmaker, his or her bones have never been recorded," Rowland said.